This is plated with an anti-corrosive finish, 7/16 " nut of extremely small size for non-security Termination of Unused F Ports. 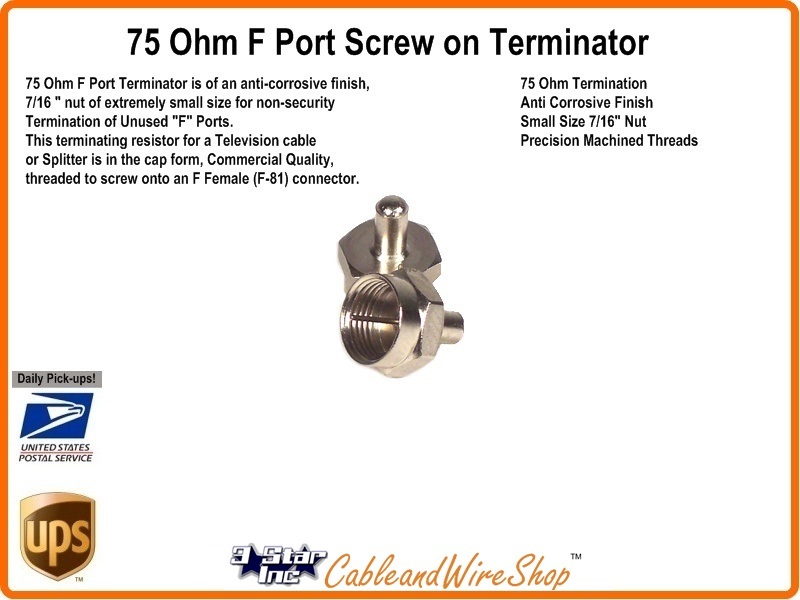 This terminating resistor for a Television cable or Splitter Is in the cap form, Commercial Quality, threaded to screw onto an F Female (F-81) connector.Use for non-security Termination of Unused F Ports on Test Equipment and Signal Sources. Terminate open Splitter Ports to prevent Ingress and Egress of RF Signal that could interfere with Modem Transmission. Note: An easy way to assure that Hi Frequency signals are not leaking from unused Ports and Test Points.